Sun, sea, sand, music and beer are creating a carnival spirit in Qingdao, Shandong province, which is holding its 27th Beer Festival until Aug 27. Since Aug 4, six of Qingdao's districts and subcities have been offering venues for visitors to try out more than 200 different beers from home and abroad. With the slogan "Qingdao ganbei (drinks) with the world", the event has become a symbol of the city's internationalization since it was first held in 1991. To date it has become one of the world's four most important beer festivals, alongside those held in Munich in Germany, London in the United Kingdom and Denver in the United States. This year's event kicked off at its main venue, the Golden Beach Beer City in Huangdao district, with a grand opening ceremony. The mayor and some international guests opened the first barrel of beer. 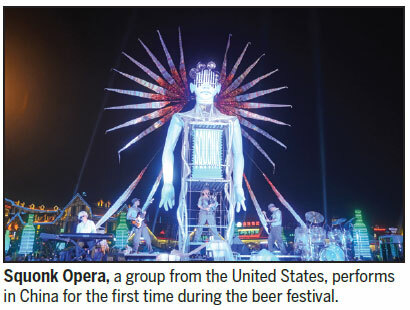 Organizers invited international bands and performance groups to enhance the atmosphere, including Squonk Opera and The Strike from the United States and Strange Fruit from Australia. The three groups are all performing in China for the first time and playing alongside Chinese bands. 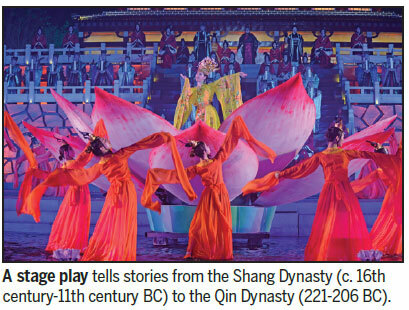 Organizers have also been putting on a historical stage play every night, telling the story of the district from the Shang Dynasty (16th century-11th century BC) to the Qin Dynasty (221-206 BC). The show uses lights, music and special effects on a stage built above the sea to better tell the story of inheritance and development. Qingdao is hometown of Tsingtao Beer. Tsingtao Brewery Co Ltd, which was previously the Nordic Brewery Co Ltd, was founded in August 1903 in Qingdao by German and British settlers. With a long history of beer production, Tsingtao is now among the world's top 500 most influential brands. Valued at more than 117 billion yuan ($17.5 billion; 14.9 billion euros; ￡13.7 billion), Tsingtao Brewery has been China's leading brewer for 13 years. A historical play has been staged every evening during the beer festival.